Glovers Reef is the southernmost of three atolls off Belize’s coast. The southern part of Glovers is approximately 30 nautical miles from Placencia, a journey which takes a little more than an hour and a half. The ride is certainly worth every minute as some of the best scuba diving in the Caribbean and in Belize can be found here. Glovers Atoll is an oval shaped reef system 15 miles long by 4 miles wide. Five Islands lie on the eastern side where most of the diving is done. These islands are mostly private with small diving and fishing resorts. The pristine waters with unique coral formations and tons of marine life makes Glovers reef a popular spot for divers wanting to see the best Belize has to offer. Glovers is one of UNESCO’s world heritage sites and a marine reserve with designated no take and conservation zones. 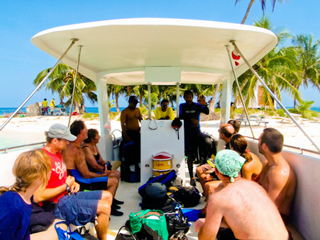 We recommend all our divers, whether taking a fun dive package, a day trip, or on a resort diving package, take the time to visit Glovers Reef as it also represents some of the best diving in Belize, and is accessible from Placencia. With crystal clear water and all the marine life to be seen here, this site is like diving in a manmade enclosed aquarium. To be well assured we see the most activity, we dive this site early in the morning or later in the afternoon. This site is famous for large schools of yellowtail snappers and creole wrasse either out in mid-water or cruising along the wall in and around cleaning stations. Schools of horse eye jacks and black durgons can also be seen playing on the edge of the wall. Dolphins and turtles are common sightings at this site. This wall starts at 25 feet/8mt then drops steep 6000feet/1800mt into the Barlet deep, the deepest trench in the Caribbean. Because of the usual mild current and wave action, this site is always full of marine life feeding on organisms brought by the currents. 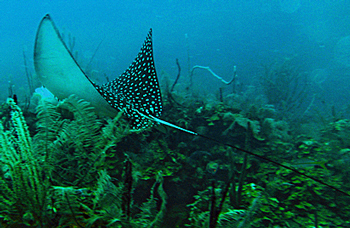 Visibility at this site is usually more than 100 feet making this a spectacular dive. Critters here include Nassau groupers, lobsters, eagle rays and several species of huge snappers. Occasionally in the months of December to February giant manta rays can be seen gliding close to the surface. This site got its name from the island resort closest to Glovers reef. 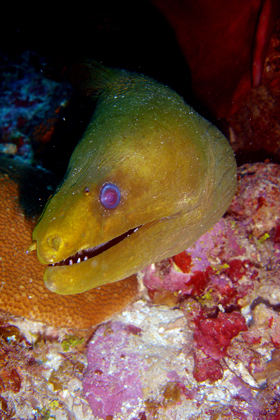 The dive starts in a sandy area then heads south to a massive wall of stony corals. Great star corals, boulder star and mound corals create unique swim troughs and also shelters nurse sharks and huge groupers. Smaller tropical reef fish can be found here in abundance. Queen conch, trumpet conch and the king helmet conch can be found either crawling or buried in the sandy areas around this site. The pinnacle is an interesting dive site that has lots to offer divers tired of the walls and canyon type formation. Huge pinnacles that starts at 100 feet/30mt rises up to around 25feet/8mt below the surface. Lots of sponges, plate corals and beautiful gorgonians can be found on each pinnacle. In between the pinnacles are deep sand channels where hog snappers and schoolmasters can be found. Pelagic species such as reef sharks, mackerel, tarpons, and barracudas can be seen here. This dive is done swimming around and even through a few of the pinnacles. This is Belize’s most southerly atoll and offers superb scuba diving and snorkelling. It is also Glovers reef and Belize’s best formed coral atoll structure and boasts a wide abundance of hard coral formations and marine life.